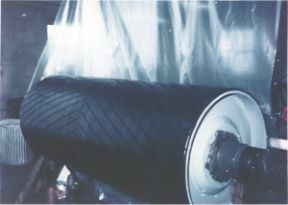 Our roll/pulley lagging services are available with vulcanized rubber applied to the pulley surface and heat-cured slide lagging which offers pulley traction pads for positive grip on drive pulleys carrying light through heavy-duty conveyor and elevator belts including steel cable belts, urethane coverings,rubber "Skrub-Kleen" cushioning mats which are designed for performance in fruit and vegetable washing operations to assist in removal of silt, soils and smaller foreign materials. 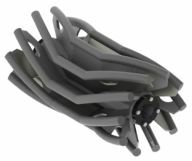 We offer heavy duty lagging procedures with herringbone-grooved patterns as well. Shenandoah offers urethane skirting, rubber skirtboard and shaker screen protector materials. The Eradicator® wing pulley’s patented design retains the belt cleaning benefits of a traditional wing while providing continuous belt contact and improved cleanout efficiency. 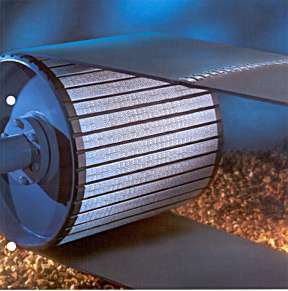 These additional benefits provide longer component life and decreased noise. Traditional wing pulleys feature straight wings which contact the belt intermittently, entrapping and recirculating material rather than displacing it, which can lead to belt damage and pulley failure.